Precious black and white party dress is by RARE EDITIONS! Adorable tiered fluttery ivory petals on entire skirt overlay; solid underlay! Bodice is black velour! Beautiful attached flower with rhinestone center at waist! RARE/EDITIONS~girl's~GORGEOUS/XMAS/BEADED/BODICE/DRESS! (12) BRAND/NEW! @@ CUTE! SEE PHOTOS.THERE ARE "FIVE/RED/ROSETTE'S/w/BLACK/BEADING" ON THE "UPPER/FRONT/AROUND/NECKLINE"! SEE PHOTOS.THERE IS A 6"~LENGTH/RED/BOW" ON FRONT OF "WAISTLINE". SEE PHOTOS.THERE ARE "SIDE/SEAM/TIES" AROUND "BACK/OF/WAISTLINE"! 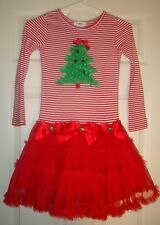 "RARE/EDITIONS" GIRL'S SIZE~6/X "EXCELLENT/CONDITION" REALLY/CUTE, "CHRISTMAS/TRESS/RED/WHITE/FANCY/LINED/DRESS"! SEE PHOTOS.THERE IS A "CHRISTMAS/TREE" ON THE "CTER/UPPER/FRONT"! SEE PHOTOS.THERE IS A "RED/BOW"ON TOP OF THE "TREE", WITH "GEMSTONE" ON "tOP"! (SEE PHOTOS #1, #2, & #3, #4) THE BOTTOM OF "SKIRT/IS/FULLY/LINED/w/3/4"/BLACK/NETTING/BENEATH/THE/SKIRT"! (SEE PHOTOS #1, & #5) THE "BODICE/&/LONG/SLEEVES" ARE A "BLACK/VELOUR"! (SEE PHOTOS #1, & #5) THERE IS A "BUTTON/CLOSURE" AT THE "CENTER/UPPER/BACK/NECKLINE"! Formal Girl's Velvet Dress Long sleeve Velvet top Deep navy top Layered skirt - fully lined Glitter and flocking details on skirt Contrasting ribbon belt and bow at waistline Tie bow back New with tags. Rare Editions Big Girl's Beaded & Velvet Fit & Flare Fanciful Dress-Size-8-Red & Black. Solid black velvet upper bodice has a round neckline and long sleeves. A large red bow sits along waistline in the front and center. The girly look and adorable vibe will allow her to pair her favorite sandals and hair accessories with this essential for the ultimate cute outfit that won't go unnoticed. 100% Polyester. Long sleeves. Red bolero jacket - separate. Attached slip inside with crinoline. Pattern: Plaid. Green bow in the front with ribbon in the back. Colors: green and red with gold thread accents. Hand wash only. She will sparkle in this girl's sequin tiered floral sweater dress! The sequins shine bring against the cozy knit fabric. The tiered skirt flows in the gracefully for an airy look. Tiered layers. Three flowers on bodice. Polyester & Spandex. Long sleeves. Waistline boasts a large red bow within a bow in the front and center. Red sash ties in back to adjust fit. Flowing red skirt reverse pleats off waistline. Full swing skirt. Emily Rose by Rare Editions Little Girl's Royal Blue & Black Tulle Fanciful Dress-Size-4. Polyester & Spandex. Gorgeous dress has a navy blue velvet upper bodice with a round neckline and long sleeves. Polyester, Nylon & Spandex. Beautiful black and red dress with the upper bodice being solid black velvet with a round neckline and long sleeves. Sash ties into a bow into a decorative bow in back and also adjusts fit. 97% Polyester, 3% Spandex - sweater knit fabric. Red sequin empire waist and first tier. Three flowers on bodice. BEYOND GORGEOUS! The Dress is a ruby red knit material with red sparkles throughout! The Dress has sparkly Rumba Ruffles stitched along the hem! JUST PRECIOUS! Perfect for this Fall/Winter! Perfect for any special occasion, this flowy chiffon dress will make her look and feel like a princess. Illusion panel with sweetheart neckline. SIZE: Girl’s/ Kid’s Size 6X. STYLE: Long sleeve black dress. Your little one will gleam in this little dress. 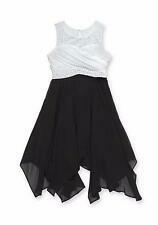 Black Velveteen Lined Dress Top Winter White Skirt Scroll Design Ties Bow 4Y. PL-Rare Too! Girls Black Velveteen Long Sleeve Top Winter White Skirt Black Scrolls 4Y. black velveteen stretch long sleeve top with winter white skirt with open pleat front with black chip bead scroll design that is repeated on both sides of skirt with back being solid cream. Has Ballerina Shoes Embroidered on the front. Ribbon, bow, and attached ruffle at bottom. Girls Size 6 Long Sleeve 2-pc Navy Corduroy Dress w/ Pink Shirt. Pink Shirt has contrast navy stitching on Neckline and Sleeve edges. Black velvet style stretch top, beautiful satin style skirted bottom, tiny black beaded flower pattern along edges, criss cross slit down front, crinoline layer underneath, soft adjustable tie waist, rise and bow in front, ties in back. Red and green color blocks along the bottom have presents embellished with sequins and rhinestones. lift each one up to reveal an appliqued surprise gift underneath ! The jumper closes with three red buttons in the back. It is a Girls Size 8 1/2. It has a black velour bodice with long sleeves. Top front center bodice has little red satin bows and a black glittery design. The skirt is red a red satin. Has a sash with front center bow and ties in the back. The dress is Girls Size 4. Rare Editions girl’s dres size 6X. The underlying turtle neck has red bows at the chest, to match the red corduroy dress. The dress has black and white gingham trim, that matches puppies ears near the bottom of the dress. Rare Editions Girls Dress. Material: Polyester / Velvet. Machine wash. Color: Red & Black. Skirt length: 24” (from waist to hem). Long Sleeve. Sleeve length: 19.5”. NEW Girls "PINK & BLUE GINGERBREAD COOKIE " Dress Size 4. Colors include - Pink/ivory stretch tee knit, Blue/pink gingerbread cookie print, Pink/white snowflake print. Accents include - Affixed pink flower at the waist, waist sash that ties in back, contrasting hem ruffle and trim. Leggings: 65%cotton, 30% polyester, 5% spandex. Toddler Girl Size Chart. Little Girl Size Chart Big Girl Size Chart. Top: 60% cotton, 40% polyester. Length 29"/. Size___________________Height_______Weight. NEW Girls "PINK & BLUE GINGERBREAD COOKIE " Dress Size 5. Colors include - Pink/ivory stretch tee knit, Blue/pink gingerbread cookie print, Pink/white snowflake print. Accents include - Affixed pink flower at the waist, waist sash that ties in back, contrasting hem ruffle and trim. Bottom skirt not stretchy fabric, red satin with flower decor skirt with lined tutu bottom fabric underneath, (has underlying lining with tutu like bottom to make skirt look fluffy). Black velvet stretchy fabric top bodice . NEW Girls "PINK & BLUE GINGERBREAD COOKIE " Dress Size 6. Colors include - Pink/ivory stretch tee knit, Blue/pink gingerbread cookie print, Pink/white snowflake print. Accents include - Affixed pink flower at the waist, waist sash that ties in back, contrasting hem ruffle and trim. Tear in black netting underneath that cannot be seen with normal wear. Last pic shows where it is. GO FOR IT! blackorchids blackorchids13 blackorchid theblackorchid lilluxuries. Polyester/spandex; lining:polyester; crinoline: nylon. A traditional long-sleeved velvet bodice combines with an embroidered satin skirt in this elegant special occasion dress by Rare Editions. Here is a dress by Rare Editions, size 6. Here is a dress by Rare Editions.size 16.this dress has long. back.the dress is velvet and the color is blue/teal. Here is a dress by Rare Too ! Girl's Rare Edition Formal Dress. hem circumference 50". white appliqued Flower Design. Black netting Bodice with. solid black lining except for sleeves. NEW Girls "RED & BLACK DOT SNOWMAN " Dress Size 14. Accents include - Large embroidered white and red felt snowman, red ribbon bow affixed at the neck. Black and white dot print. Red crochet lace trim about the sleeve cuffs and hem. It has a black velvet bodice with a dropped waistline.it has a. Here is a dress by Rare Editions. size 14.this dress has long sleeves. has a sheer top layer with a black design in silver thread. And are not doubled. My husband and I are doing what we love. We look everywhere for clothing that we fall in love with and can still be affordable. If your unhappy let us know. We want to make it right.